Advertisement from the Kansas City Sun, July 7, 1920. Via Newspapers.com. 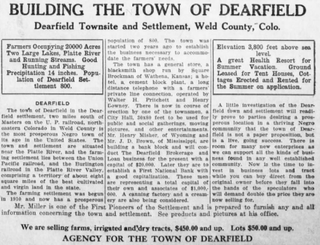 In the 1920s, Dearfield, Colorado was a thriving farming community that had been built up over a few years, thanks to the boundless energy of an entrepreneur named Oliver T. Jackson and the passage of the Enlarged Homestead Act of 1909. It was almost entirely African American. Starting in 1910, Dearfield began attracting hundreds of black homesteaders from across the South, the Midwest and the eastern portion of the Plains. They came for opportunity. At its height in the early 1920s, 700 residents lived in town, with churches, a school, a blacksmith shop, a dance hall and a restaurant. And nearly all of the residents were black. The community sustained itself on farming, taking advantage of the relatively abundant rains at the time. They had bumper crops – strawberries, squash, wheat – for more than a decade. April 7, 1916 coverage by The Bystander, Iowa’s African American newspaper. Via Newspapers.com. Unfortunately, it’s now a ghost town—the Great Depression and the Dust Bowl made it too hard to survive.